This article is cross-posted from the Huffington Post. Two years ago this week, Haiti was hit by the catastrophic earthquake that killed more than 315,000 people. Today, the work to rebuild this poorest country in the Western Hemisphere has barely gotten started. According to the U.S. Department of State, the U.N. has called this earthquake the largest urban disaster in modern history, affecting 3 million people, displacing 1.5 million and creating 10 million cubic meters of rubble. Two years later, while some significant steps have been made – less than half of those originally displaced still remain in camps, half of the 10 million cubic meters of rubble has been removed and USAID has provided approximately $108 million for emergency shelter and shelter solutions – we need to work faster and do so much more. I've always said the work we do to make our buildings green is about people and making their lives better. 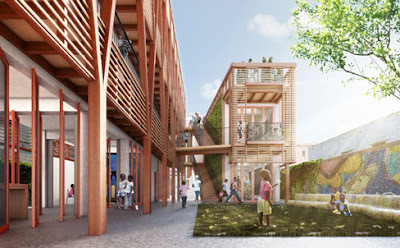 That is why the U.S. Green Building Council, along with global architectural firm HOK as the pro-bono design partner, have been working to design and construct Project Haiti, which is aiming to be a LEED Platinum orphanage and children’s center in Port au Prince. In an effort to show the children of Haiti that their lives are valued, they deserve to breathe clean air and they are cared about, it will provide for the immediate health and emotional needs of orphans and offer a pathway to adoption. And today, we are proud to release the renderings of Project Haiti, the first of many steps toward our end goal. This building is our commitment to live up to our ideal. Project Haiti will provide a safe, comfortable and nurturing environment for some of the most vulnerable people in the world. HOK’s sustainable design strategies are sensitive to the culture and history of Haiti, while at the same time including passive elements that require minimal maintenance and are not dependent on mechanical systems. 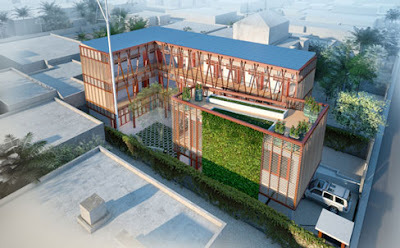 Aspects such as natural ventilation, a safe water supply, an on-site power generator that uses solar, wind and biofuel and biomimetic design features will all be incorporated to create a building that is environmentally and financially sustainable for the people of Haiti. I have witnessed for myself the amazing resiliency of the Haitian people who wake up every morning in the tent cities, wash themselves in a bowl of water and do whatever they can in the oppressive heat and sun to make an honest day's wage. But nothing has had more of an impact than meeting the hundreds of orphans that have made Project Haiti not just a professional obligation, but a personal commitment. As we soberly acknowledge this two-year mark, I'm asking that you reflect on the efforts being made to rebuild Haiti and engage in USGBC’s work with Project Haiti. Whether you simply learn more about the project, make a donation or spread the word, every little bit helps to get us to our goal to do just this one critical thing. I guarantee it helps us show the developing world that sustainable building practices are not just for the well-off, but for everyone. Why is light-gauge steel stud construction not even mentioned in this story on Haiti? This technology spares the forests, is impervious to termites, excels in ability to withstand earthquakes and hurricanes, has an enviable fire insurance rating, and can virtually eliminate the need for specialized construction crews? Thanks for your response. Verne Strickland, Wilmington NC (910) 815-0120.